Do you want a pair of sturdy, resistant boots that can withstand anything? Are you sick and tired of the stitches of your regular boots always coming undone after a few months of use? Are your feet always tired because you have to be up and about for hours at a time? Then you need the best tactical boots for the job. These babies are specially designed to offer you great support, so you won’t have any feet problems. Your feet will feel comfortable, and best of all, you won’t have to buy a new pair twice per year. And all that in extreme weather and terrain, for hunting, construction work, hiking or military purposes. Think we’re making all this up? Well, read on because we’re going to show you these boots are real. But you need to know how to choose them, so we’ve discussed some of the essential factors to consider. We’ve also critically examined some of the most awesome products on the market, so hopefully, you’ll find something you like here. This is extremely important because it will tell you how comfortable and sturdy the boots are, and also where you can wear them. For instance, leather is very resistant, but it’s also difficult to maintain because it’s prone to scratches. It’s also very warm, so a combination of nylon or another synthetic material is what’s usually done. You also want grip and traction on the outsole, that should be resistant to slips, so look for a rubber or Vibram manufacturing. Don’t neglect the inner sole which should be padded enough, yet made from moisture-wicking materials so you won’t have issues even if you sweat. The closing system is very important for support and comfort. So you can either choose a boot with laces, zippers or both. The advantage of laces is that you can adjust them for different conditions, like when you’re warmer, thicker socks. On the other hand, zippers are much quicker to close, so they’re great when you’re lacking time. That’s why a combination of zippers and laces sounds the best way to go. Just make sure the zippers aren’t flimsy or anything if you don’t have the backup laces. 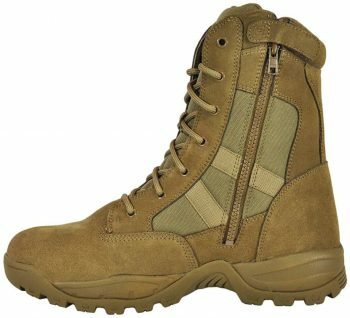 This is essential for ankle support, and the standard military design means that you’ll have a shaft of about 8 inches. However, the shaft can be smaller, at about 5 inches and still provide the optimal support. The difference is that a higher, mid-calf shaft can protect you from dirt, debris, snow or bugs getting inside your boot. Also, make sure the shaft is padded around the ankle area if you’re looking for that extra comfort. It’s obvious that you’re after a great fit, so check both online user reviews before purchasing boots online, as well as the size chart available for each product. You should also know what your size is, and what fitting issues you already have. Besides, you should wear appropriate types of socks because some boots might run a little big. However, it’s always best to err on the larger size because at least then you can add a sock liner or a thicker sock. If you’re frequently walking through marshes, snow or puddles, you need waterproof boots. Otherwise, water-resistant models are great for everyday use, though you should make sure water can’t get in through the stitches, lace notches or zippers either. When it comes to terrain resistance, you should check that the stitches can handle prolonged and rugged use. The same goes for the zippers, which need to be big and sturdy. You should also make sure the outsole can’t break and that the outside materials used won’t rip. We’ll discuss the items below in terms of their purpose, listing their pros and cons too so you can make an informed decision. 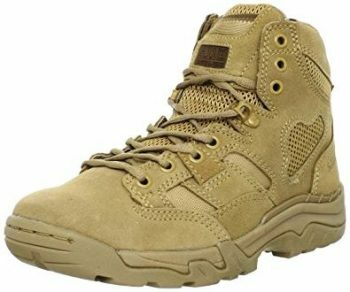 Description: The Maelstrom TAC FORCE Work Boot is great for hiking because it has a resistant leather and fabric construction. The leather can be polished, to overcome one obvious disadvantage, that it’s prone to scratches. However, the nylon upper is more resistant to scratches and rugged terrain, though the combination between these two makes the boots impossibly warm for higher temperatures. We also love the Dri-Lex membrane that is obviously an asset because it’s waterproof and also thanks to the full construction. The outsole is made from rubber, so it provides cushioning as well as a good grip, considering that it’s resistant to all possible slips. The inner sole can be more cushiony too if you add the impact-absorbent insert, so you can wear it for prolonged hikes. The collar and tongue are also padded, which provides more comfort and protection against impacts. And don’t forget the midsole which is very light and contributes to the impact-absorbing too. The side zipper is amazingly quick to close, and it’s also heavy duty so you know it won’t break easily. And if you’re looking for added stability, the composite shank is perfect in that regard. We also appreciate the 7-inch shaft in terms of stability because it’s high enough. Related: The Samtree Canvas Web Belt is a double-grommet belt which makes it perfect for tactical use, as well as hiking. Besides, it can be adjusted for men and women alike. 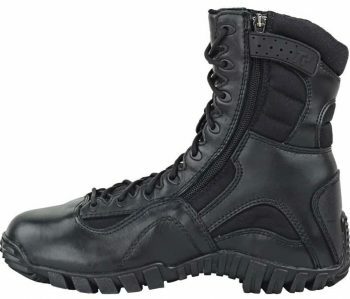 Description: The 5.11 Taclite Tactical Boot is another combination of leather and textile, but these boots have a synthetic sole. That might make them easy to scratch, so they’re definitely not for the very rugged terrain. However, they have a moisture-wicking interior that won’t let that sweat inconvenience you too much. We love their OrthoLite sock liner, a real asset in terms of comfort and also the fact that they have an anti-bacterial interior. That’s not just great in terms of health, but also because it kills off the odor-producing bacteria so you won’t get smelly fit. All that, along with the side vents, make these boots perfect for the hot and humid weather. 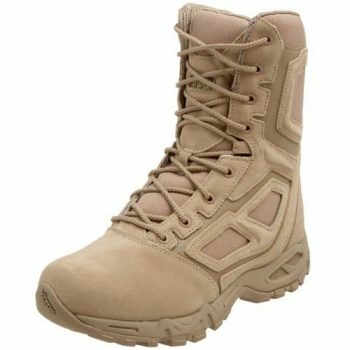 With a 5-inch shaft, these boots aren’t as high as the Maelstrom TAC Force, but they still provide great ankle support. And don’t forget the perforated EVA foam with which the ankles are padded. The outsole is oil-resistant and it doesn’t squeak when you walk, which is great. As opposed to the Maelstrom boots, these ones are tied with laces, but that makes them easily adjustable for a great fit. You might find these boots a bit on the larger size though, so make sure you use the size chart carefully when selecting the right size for you. Related: The 5.11 Tactical TacLite Pro Pant is great in the same weather and terrain with the 5.11 boots. Thanks to their cotton and polyester mix, these are breathable, yet moisture-wicking, so you can wear them in hot, humid weather too. 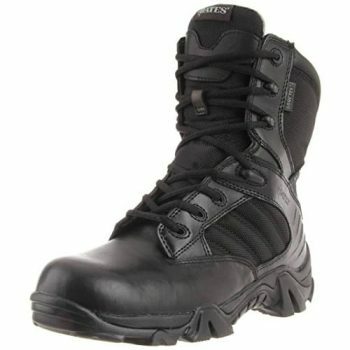 Description: The Ryno Gear Tactical Combat Boots are great for paintball or walking to and from work. They’re a light duty type of boots, so you can’t use them on difficult terrain like you would for hiking in the mountains. However, if you don’t seem to get along with them take advantage of the free return available. The construction is great for urban use, with leather and ballistic nylon for extra comfort. They’re also great for extremely cold temperatures because of the leather used, but that’s also what can make them easy to scratch. The insoles can easily be removed, but they’re shock-absorbent so really comfortable for people with bone issues. For such a low retail price, the padded collar comes as a real bonus, just like the contrast stitching. The mesh lining is a plus too, making these boots breathable, while the inner lining proves water-resistant so you can wear them even when it’s raining or snowing. Besides, the rubber outsole won’t allow you to slip on ice, but the zippers used are pretty cheap and easy to break. Related: The Jiusy Touch Screen Tactical Gloves are amazing for hunting and paintball because they have an anatomic fit, they’re shock-absorbent and let your skin breathe. That said, they’re the perfect choice to complete your tactical outfit along with the Ryno Combat Boots. Description: The Smith & Wesson Breach 2.0 Tactical Boots are made from leather and they come with the Smith & Wesson guarantee of quality since this is a reputable brand. They also have nylon on the sides and on the tongue, which is water-resistant. Besides, the tongue is gusseted too, so there’s little chance of getting debris inside them. The EVA midsole is great in terms of support, it’s a real cushiony material, but the steel shank adds to this support as well. The overall design is board-lasted, which means these boots are rigid enough not to let your feet get tired because of constant use. The outsole made from rubber is another feature we love, making these boots resistant to slips and with a great grip on different surfaces, including dirt and waxed areas. But mostly, this outsole works well for urban wear, and not so much for the great outdoors, at least not on a regular basis. Related: The Smith & Wesson H.R.T. SWHRT9B Fixed Blade Knife is great for throwing or as a boot knife for survival purposes. It’s light, inexpensive and resistant, so it’s amazing for tactical purposes. 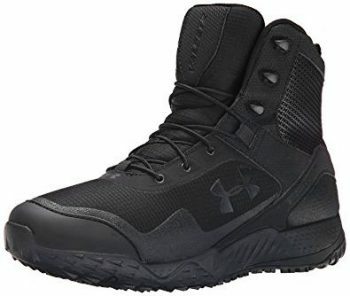 Description: The Under Armour Valsetz RTS Tactical Boots scream comfort through each of their synthetic leather pores. The rubber sole is perfect too in terms of both grip and comfort on a terrain that’s difficult to navigate or slippery. The ankle-high shaft is another plus, considering that it provides the needed ankle support for difficult ascents or descents. Besides, thanks to the registered UA ClutchFit, your ankle will feel even more supported and cushioned. And the TPU shank also helps with that, providing the needed rigidity for optimal support. We also love the textile upper because it has a welded film going around your feet which is resistant to abrasions. And don’t forget the Micro G foam, this is great for cushioning your feet each time you jump. But the feature we like most is the molded Ortholite sock liner because this is manufactured with memory foam. However, even if they’re comfortable, these boots aren’t made for constant use. So don’t wear them as a work boot, the sole might easily become undone. That means they’re perfect for a quick hike or a day at the combat range, though you might feel they’re overpriced for that even if they’re extremely comfy. Related: The Condor Outdoor Combat Shirt is awesome for tactical purposes. We really love it because it’s light, comfortable, and breathable, so we think it would go very well with the Under Armour Tactical Boots. 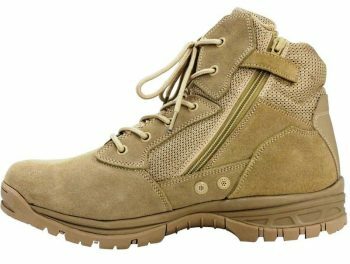 Description: The Belleville TR960Z Tactical Research Khyber Boots are another pair of comfortable, impact-resistant, debris-banishing boots. The 8-inch shaft is the standard military height, so you know you’ll get the optimal support even in very difficult tactical situations. You can rely on the mid-calf support in very difficult weather too, like when it’s really snowy. The leather and synthetic construction is great for very cold weather too, seeing as leather is a really warm material. The synthetic parts add a bit of breathability to this mix, even though some heavier duty stitching might seem more reliable. The tongue is high enough to prevent most debris getting inside your boots, though a bit more padded would add to the comfort of intense wear. The Vibram outsole is great in terms of comfort and traction, and we love how resistant these boots are to stuff like petroleum, oil or lubricant. On another note, the zipper could be bigger, it seems a bit flimsy for rugged, everyday use. Related: The Leather Luster Kit Black Finish will help you keep the shine on these boots, repairing the micro-scratches and protecting them for another day of rugged use. Description: The Magnum Elite Spider Boot is great for desert-like weather and terrain thanks to their breathable construction and amazing features. For instance, we love the SpiderMESH lining because it’s moisture-wicking so it won’t keep your feet drowning in sweat even in the hottest weather. That said, the construction is still very sturdy and resistant, don’t imagine you’ll be wearing mesh boots. The leather used is quite resilient, just like the suede and nylon for the upper. But what really brings resistance to the game are the web-like overlays and the full lace-up panel even if the lacing won’t be as quick. The shaft is very rugged too since it’s made from composite, so we really appreciate its non-metallic construction that gets you past airport security. The Vibram outsole is amazing for traction, and the padded collar and tongue along with the removable sock liner add comfort to the game. These boots are waterproof too, so that’s another plus. Related: The Rothco Elastic Blousing Garter are very resistant, they have really sturdy hooks and a perfect for blousing your pants when you’re going through a marshland. That way, you’re sure to keep any bugs out of your pants and boots. Description: The Bates GX-8 GTX Boot is another pair of extremely resilient boots for heavy-duty use. They’re made from a combination of full-grain leather and ballistic nylon, which is really great in terms of warmth. Besides, they’re waterproof so they can be worn in different weather too, may it rain or snow. The 8-inch shaft is just what you need for maximum support and it will also prove an outstanding protection against dirt and debris. We also love the Gore-Tex lining in terms of protection against water. The side zippers are great for easy wear in conditions when the time is of the essence, but they’re not that resistant, so you might use the laces more. We love the EVA midsole for extreme cushioning, and the footbed is comfortable too. However, you can remove it if you don’t need the extra arch support or if you get too hot. On the other hand, there’s not much padding around the ankle and toe areas, so the overall comfort is a bit lacking. Still, the rubber outsole is great for traction, and it’s also resistant to slippery terrain and oily areas. Related: The Raine Military Sewing Kit might be just the thing for you. If something happens to your boots or to your other tactical gear, you can easily repair it with this easy-to-carry and fully-supplied kit. Now that you’re here, you’re probably an expert on choosing these tactical boots, right? We’ve told you all about how the materials used and the overall design impact comfort and durability. We’ve also discussed some eight amazing boots in terms of their specific features and their recommended use. So what will you pick? Do you want a pair of boots for paintball, for hiking, for military deployment or for construction work? What sort of boots have you tried so far? We’re curious to know what you love and what you hate, so leave us a comment below!